Are these babies not cute? 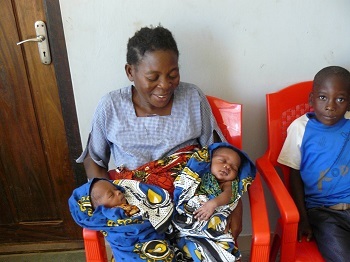 These twins, Jackson and Johnson, were born to their mother Mary in August 2013 by Caesarean section. After the operation she did not get milk to feed them. So she came to us and asked for help. As we have no cow here at St. Tekla community, we made an agreement that she may come every 10 days to collect money to buy milk from a neighbor who has cows. We taught her how to dilute it that the children can tolerate it until they are bigger. The mother was very grateful for that. The family itself would not be able to afford as she has still 5 more children at home and the father has no employment. Through donations, we are able to make sure families are fed and newborns get the care they need. Never underestimate the value of your donation.